It is heavy; scratched, weather-beaten, worn out over the ages and yet, it survives. Being held in a brown coloured plastic cutlery holder currently, it sits almost abandoned among the new ones. They are shiny, lighter when held, cleaner even as Papa often suggests. We leave it alone. Try to ignore it as if it would stir something in us that we are not ready to face. In fact, even if it is the only spoon remaining in the holder, we wash the used ones. It is thick, impenetrable also just like Dadu. If I were to drop it, it would make a loud thud on the flooring. Like his spoon, if Dadu bellowed, which he often did, we would all run helter-skelter. Denser than most I have ever come across; heavy with memories of his past, his then present and future. As I said, it is like no other – of no consequence, a misfit among the new set. We can't be rid of it though. It is a bane and a boon. Bane when it topples the cutlery holder, unbalancing its weight, beneficial when it came handy to balance it all. Just like Dadu. Funny, how a heavy spoon of no great design can hold its own. I don't know when this spoon came to be in his possession. In the thirty-one summers of my life, I have always felt its presence. Over the years, the spoon has been a part of the kitchen, tossed with knives, ladles and other kitchen paraphernalia. It lived in his writing desk too. Whenever I asked him to come for lunch or dinner, he would take out his spoon. It never left his side. If there was a backstory to this particular piece of cutlery, I don't know of it. He took it everywhere he went. I remember this even today. Every summer holiday we, my grandparents, my sister and I would visit my aunt. She had a Pomeranian, Lacy. An absolute delight, the furball adored Dadu, and he naturally returned the affection. They were inseparable. Lacy would follow him around the whole day, going for walks, sitting by his feet as he watched the news or read the newspaper. She also never left him alone when he ate. One morning, I was up early, so I joined him for breakfast. A creature of habit, he always ate doi cheede with kola (curd with flattened rice, topped with banana). He used a big bowl, apt for the intimidating man he was. Once he added the three ingredients, he sprinkled his dish with a generous amount of sugar. No wonder Lacy wanted the same and would sit at his feet, looking up longingly. At first, Dadu would make a face, reprimand the dog but soon he would plying the animal with a spoon after spoon of his sweet delight, all the while calling it names, especially ‘haangoad' a glutton. He would point his spoon at the pup, warning it even. Over the last 17 years since he left us, the spoon remained constant. We moved homes. We travelled. We grew up. We moved our dinners to the dining table unlike sitting on the floor. We changed our steel plates to Corelle. I see it every day, sitting among the steel pieces on its own. We avoid it. Its old, it heavy, it has a weird feeling to it and all other excuses we can conjure. It will always be a constant just like Dadu. We never asked him questions, and he never bothered us. 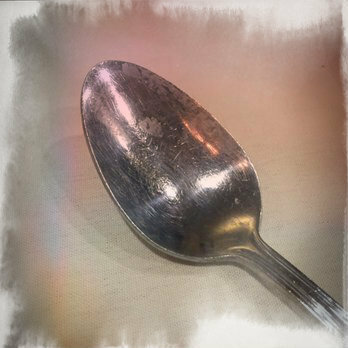 Even though things have changed, his memories speak to us, especially from his spoon.